The Indianapolis Checkers were back for their second season in the IHL after five seasons in the defunct Central Hockey League. 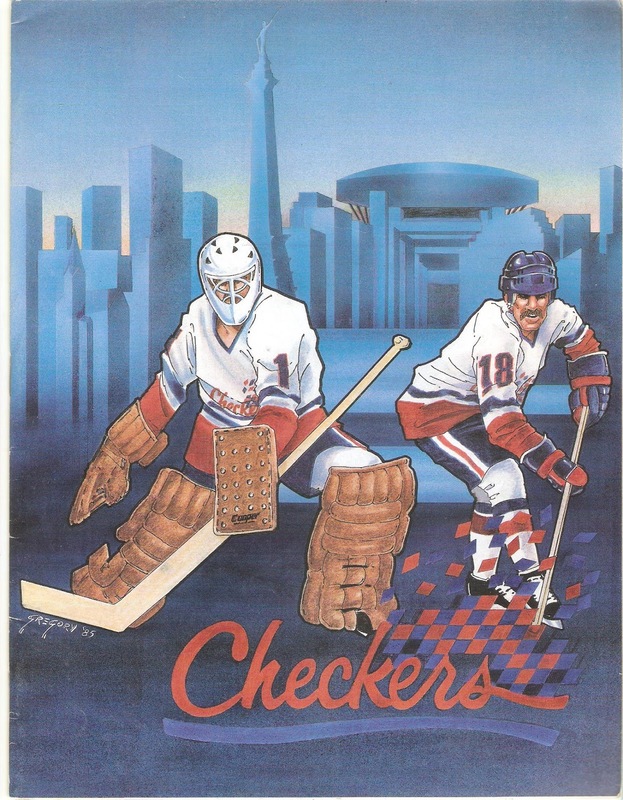 The Checkers remained a secondary affiliate of both the New York Islanders and Minnesota North Stars. Larry Woods purchased the Checkers after the 1984-85 season and moved the team to the 15,900-seat Market Square Arena, home of the NBA's Indiana Pacers. The team kept their Islanders-styled uniforms, but changed the logo. Former Port Huron Flags coach Ron Ullyot was named Coach/GM of the Checkers, and his team greatly improved on their first IHL season. Indy finished with a 41-35-6 mark. They finished last in the very competitive West Division, which had all the teams win at least 40 games. The Checkers' 88 points would have easily taken fourth place in the East. Indy scored just 296 goals that year, better than only Flint and Toledo. Longtime minor leaguer Charlie Skojdt led the team with 28 goals and 93 points. Three other Checkers had at least 20 goals, including Bob Lakso with a team-best 41. On defense, Indy allowed 303 goals, fifth-fewest in "The I". Checkers CHL holdover Rob Holland and Mike Zanier split the goaltending chores that year, with each winning over 20 games. Both netminders saw action in the playoffs. Only the dying Toledo Goaldiggers and hapless Flint Spirits missed the playoffs, so the Checkers made the postseason for the seventh straight year. However, their opponent was the Muskegon Lumberjacks, who ran away with the East title with a 50-27-5 record. Indy put up a fight, but were no match for the high-powered Lumberjacks, who downed the Checkers in five games (best of seven). Muskegon would lose only one other playoff game as they roared to the Turner Cup. I have a program from every season of Checkers hockey except the first. This is another nice program. It's 56 pages long, mostly black-and-white, but there are some color ads. Larry Woods's purchase of the team and an interview are featured on a couple pages. Three IHL teams have bios: Saginaw Generals, Toledo Goaldiggers and Flint Spirits. Mayor William Hudnut, Stars GM Lou Nanne and Islanders GM Bill Torrey each wrote letters wishing the team good luck on the upcoming season. Skojdt was a player this year, but also was Head of Corporate Marketing. Odd combination. The previous owner said this is a program from a game between the Checkers and Flint Spirits. No roster sheet, so I guess I'll take his word for it. Local ads include Sharp Ford, Indy Connection Limousines Inc., Warren Tailors and City Taproom Bar and Restaurant.